"There is … a considerable body of work building ontologies for the food and agriculture domain, which has gone hand in hand with the development of Linked Data (and LOD) in the agri-food domain. The major effort here has been AGROVOC." (ICT-AGRI 2 ICT and robotics for sustainable agriculture, 2018). The Food and Agriculture Organization (FAO) of the United Nations has maintained the AGROVOC multilingual thesaurus since 1980. 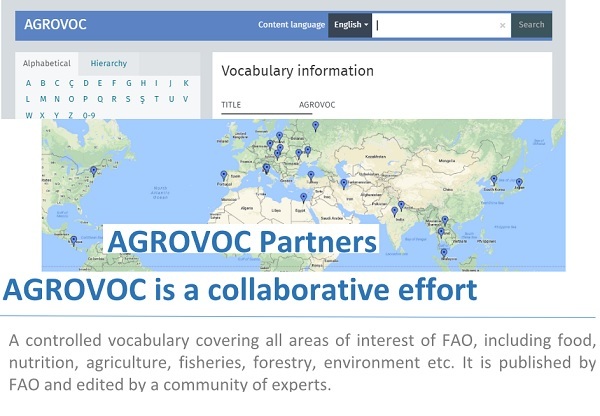 Currently, AGROVOC is a collaborative effort, kept up to date by FAO and by an international community of experts and institutions serving as focal points for specific languages or topics in the agriculture and related sectors. As of June 2018, AGROVOC counts up to 36.000 concepts and 670,000 terms in up to 29 languages. AGROVOC content in FAO languages: English, Russian, French, Spanish, Arabic and Chinese is released under Creative Commons Attribution 3.0 IGO license, while content in other languages rests with the institutions that authorized it. Since its inception, the use of AGROVOC has been progressively increased and diversified. In particular, the AGROVOC thesaurus is widely used in specialized libraries as well as in digital libraries and repositories to index content and for the purpose of text mining. It is also used as a specialized tagging resource for content organisation by FAO and third-party stakeholders (see: AGROVOC Thesaurus: some use cases). AGROVOC is indexed in FAIRsharing, AgroPortal, BARTOC, Dublin Core KOS Relation Vocabulary, VEST Registry, Research Vocabularies Australia, just to name a few. AGROVOC releases officially include two specialized concepts schemes: AGROVOC and the Linked Land Governance Thesaurus LandVoc. AGROVOC has been published as an SKOS-XL concept scheme and as a Linked Open Data (LOD) ready to be used in different LOD environments (e.g., Linguistic Linked Open Data) and aligned with a number of other multilingual knowledge organization systems. Efficient editorial workflow processes to support the ongoing development of AGROVOC subject coverage are ensured by dedicated web services and VocBench2 - a free and open source RDF modelling web environment (see: VocBench 2 Documentation; VocBench: The Data View: Editing SKOS Thesauri). In the near future, AGROVOC will migrate to the powerful ontology editing environment VocBench3 (see: The Data View). The FAO LOD-enabled Bibliographic Data Recommendations provide guidance on how to produce quality metadata subject access (LODE-BD, 3.5.1. Subject) to bibliographical records by using AGROVOC and other widely used LOD Knowledge Organisation Systems. The first AGROVOC Editors meeting was held 25-26 June 2018 in Utrecht, The Netherlands, organized by FAO and the LandPortal Foundation. Twenty-five experts gathered for very interesting discussions on AGROVOC. A summary of this meeting will be shared in the near future. In order to facilitate CGIAR Research Programs (CRPs) cross-repository searching and enhance discovery of CGIAR information products through Open Access (OA), the CG Core Metadata Schema and Application Profile (AP) was designed. This AP used by CGIAR Research Center and CRP repositories is intended to be the minimum set of elements applicable across CGIAR Centers, data streams, and formats. Application of the CG Core to Center publication and data repositories and relevant databases enables consistent annotation of final research products, to enable adherence to OA-Open Data under the “FAIR” principles: Findability, Accessibility, Interoperability, and Reusability. CG core also allows meta-searching and indexing across CGIAR repositories and databases and inter-linking across multiple resources. has several elements designed to use common vocabularies and lists. These terms are incorporated into repositories as “pick CGIAR lists” or as autocomplete/suggested text. Terms for the “Subject” element should come from more widely used vocabularies like AGROVOC, CABI Thesaurus or the Global Agricultural Concept Scheme (GACS). The subject matter of the research, technologies tested, crops involved in the research, methodologies, etc. Further work is needed around harmonization of Center-specific terms where terms overlaps. Further work also needed to harmonize CG subjects with AGROVOC when possible. Vocabulary used for each subject term. For more details, including information on technical implementation of the CG Core Metadata Schema, read on the CG Core Metadata Schema and Application Profile (AP).